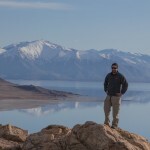 Malan’s Peak is a popular hike that can be accessed directly from the city of Ogden. The trail takes you steeply and quickly about half way up the north side of Mount Ogden to Malan’s Peak. From there you can continue on a little further to Malan’s Basin and even beyond that. There are lots of options, which we will get into. As I mentioned above, I started at the 29th street trailhead. Start by following signs for the Bonneville Shoreline trail and then to Taylor Canyon South. After about 0.9mi you will come to a foot bridge that goes over a dry creek bed. Don’t worry, you’ll get to the wet creek soon enough. It’s dry down here because this particular creek is funneled underground and into the Ogden city water supply a little ways east of you. This foot bridge also marks the spot that the 27th and 29th street trails meet up. From the foot bridge you have two options which will eventually take you to the same place. If you cross the bridge and head east (turn right) following the signs you’ll be on the Taylor Canyon North trail. You can also stay on the south side of the bridge on a much less maintained trail (Taylor Canyon South) that runs parallel to the north trail (just on the opposite side of the creek) and will eventually meet up on the Malan’s Peak trail. Doing so does require a VERY steep incline up a path next to a long waterfall though. I recommend doing this part on the way back, downhill, and chose to do that on my hike. Continuing up the main Taylor Canyon North trail you will pass a few small waterfalls and eventually come to a sign pointing south. This is the start of the actual Malan’s Peak trail. If the hiking you’d done so far has already worn you out then prepare for shock and awe. Everything so far was just a warm-up. The hike up on Malan’s Peak trail consists of about a mile and a half of extremely steep switchbacks that seem like they’re never going to end. I typically make it a point to maintain a pace on my hikes that I can continue without stopping for breaks often, but I had to stop quite a bit here. It just seemed like it would never end. 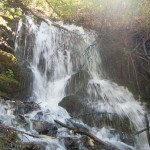 Shortly after you start up the Malan’s Peak trail you’ll hear a waterfall coming from down below off to your right. 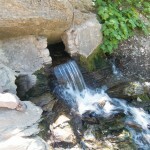 From down there you can see a natural spring pouring out of the side of the mountain and creating a long, gradual waterfall down below. This is also where the Taylor Canyon South trail meets up. You can hike down to it but it is VERY steep so you really end up sliding down. I chose to bypass it for now and go back via the Taylor Canyon South trail which would take me back past it. 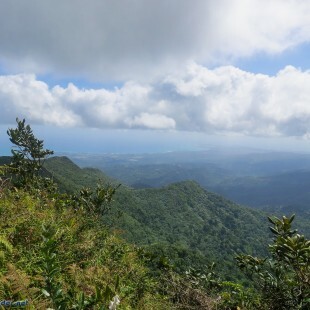 The bright side to your strenuous trek up the Malan’s Peak trail is that you’ll get some great views along the way, so long as you remember to look behind you occasionally. Looking east into the canyon your view will be dominated by Allen Peak, a false peak on Mount Ogden. Eventually you’ll get a glimpse of the Mount Ogden peak (it’s the one with the radio tower on top), though from your angle it will probably appear to be lower than Allen Peak. To the north you’ll get a profile view of Lewis Peak in the foreground and Ben Lomond Peak towering behind it. Additionally, the scenery will change all around you and you’ll eventually get up high enough that you’re enveloped in traditional alpine scenery with tall evergreen trees shading your path. After grueling and cursing that these damn switchbacks will never end, you’ll eventually arrive at a flat area that juts out to the west. This is Malan’s Peak and you’ll recognize it when you get there. Looking east from Malan’s Peak. Mount Ogden peak is a little clearer now in the top right. After enjoying the views for a little while you’re left with a choice. You can call it a day and head back the way you came, or you can keep going to Malan’s Basin where you’re presented with even more options. I chose to continue on to Malan’s Basin, which was another 0.8mi or so. It starts uphill briefly and then heads down to the basin. Malan’s Basin is a mountain meadow that was the former site of the Malan Heights Resort, which was open from 1893-1913. There’s not much left of the place other than a plaque that tells you about the resort and what the prices used to be, which seem crazy by today’s standards. From the basin you’re again presented with some choices. 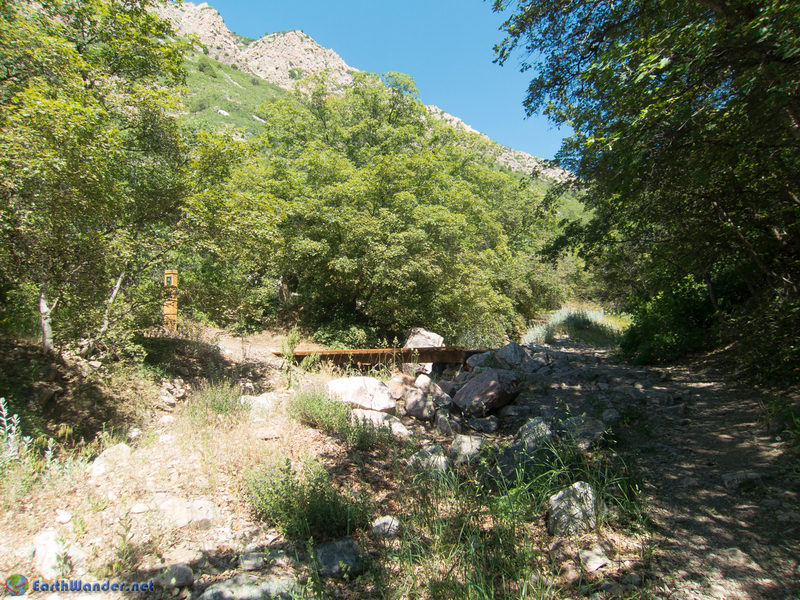 You can head back the way you came, you can turn left (east) on a narrow trail that leads all the way to the peak of Mount Ogden, or you can turn right (west) onto another narrow trail that creates a loop back to your starting point via Waterfall Canyon. Take note though that this trail gets VERY thin at times and also VERY steep, especially near the waterfall. I haven’t done it yet myself but plan to. I chose to head back the way I came, and made the trek back to Malan’s Peak and then back to the 29th street trailhead. As mentioned before, one thing of note on the way back is that I turned off of the Malan’s Peak trail onto the Taylor Canyon South trail to check out the spring/waterfall I’d mentioned earlier. It’s a cool sight, but hard to capture in photos since it’s such a long decline. Below the waterfall the trail splits. Right goes to Taylor Canyon North and left goes to Taylor Canyon South. I chose the south side since I’d taken north on the way up. It’s less frequented and more rocky but I think I preferred it. If you don’t like it then the south trail is just across the creek and you can get over there via several of the small waterfalls along the way. Eventually the south trail pretty much diminished into nothing and I crossed back where the creek was dry just before the foot bridge that splits the two trails. From there it was an easy stroll back to the trailhead.